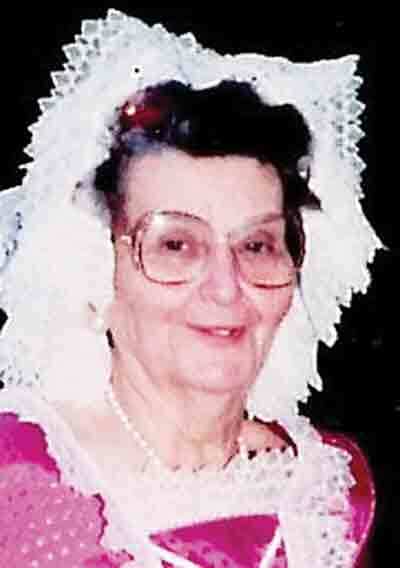 Bonnie M. Drake, 96, of Glenville, passed away September 6, 2018, at the Glenville Health Care Center, Glenville, after complications of Alzheimer’s disease. She was born April 15, 1922, at Walton, the daughter of the late Preston Murphy “Pat” and Lessie Virginia Starcher Larch. In addition to her parents, she was preceded in death by her husband, Claude Dewey Drake, Jr. and two great grandchildren. Survivors include her children, Saundra “Sandy” Kelley of Goldsboro, N.C., Peggy Easter of St. Albans, Kay Winter of Nitro, Harry Drake of Glenville, C.D. Drake, III, also of Glenville and Robin Jones of Pt. Pleasant; sister, Margaret Geraldine “Jodie” Keen of Scott Depot; 16 grandchildren, Cheryl Bergeron, Mark Kelley, Randy Easter, Tom Easter, Vicki Easter, Jay Easter, Penny Conrad, Leslie Sims, Patricia Bishop, Rebecca Hawkins, Sara Drake, Brad Drake, Jenny Drake, Steve Jones, Emily Deligatti and Elizabeth Ramirez; 25 great grandchildren, 11 step great grandchildren, 11 great great grandchildren and three step great great grandchildren. Mrs. Drake was a member of the Order of the Eastern Star and the Rebekah’s, Glenville. She was a member of the Rock Grove Baptist Church, Linn. Also, she was a member and served on the Board of Directors of the Gilmer County Senior Citizens and a Belle at the State Folk Festival. Mrs. Drake was a long time active member of the Farm Women’s Club (CEOS) and the Farm Bureau, Gilmer County. She and her husband, Claude Jr., were owners of “Bonnie & Claude’s Antiques” for many years and they worked at the Glenville Auction Barn, as well. The family will receive friends from 5-7 p.m. Sunday, September 9 and from noon until 1:00 p.m. Monday at the John H. Taylor Funeral Home, Spencer, where funeral services will be conducted at 1:00 p.m., with the Rev. Kenny Fisher officiating. Burial will be in the Clover Cemetery, Clover.